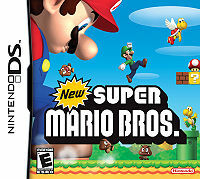 This article is a short summary of New Super Mario Bros..
Boxart of New Super Mario Bros.
New Super Mario Bros. is a Nintendo DS game in the Super Mario series that was developed by Nintendo EAD and published by Nintendo. First released on May 15, 2006, it is an indirect continuation of the classic Super Mario Bros. games that debuted on the Nintendo Entertainment System, being a traditional side-scrolling platformer and incorporating many ideas from the older games. The game inspired and was followed by a number of other New Super Mario Bros. titles, which all share similar graphics and gameplay: New Super Mario Bros. Wii for the Wii, New Super Mario Bros. 2 for the Nintendo 3DS and New Super Mario Bros. U for the Wii U. Jump into an all-new Mario adventure! Run, jump and stomp your way through unthinkable land and unimaginable challenges! Challenge a friend to a wireless face-off on special levels, or play with up to three friends in a ton of Touch Screen minigames. Run, jump and stomp your way through raging volcanoes, tropical islands, snowcapped peaks, and unimaginable challenges! Grab a Mega Mushroom and grow to incredible proportions, or smash through your foes with a blue Koopa shell! Challenge a friend to a wireless face-off on special levels, or play with up to three friends in a ton of Touch Screen minigames. Mario and Princess Peach are walking in the garden. Suddenly, a thunderbolt shocks the Princess's castle, and Mario goes to investigate. While the plumber is distracted, Bowser Jr. sneaks up and kidnaps Princess Peach, forcing Mario to go after him and travel through numerous worlds in order to rescue her. Basic Gameplay is that of a 2D side-scrolling platformer, in that the player controls Mario, traversing levels by running and jumping. The object of each level is to make it to the flagpole at the end of the stage. The game features eight worlds with eight to twelve levels in each world. In the last level of each world, there is a boss fight. Spread throughout the levels are blocks, which contain coins and various power-ups which aid the player in getting through each level. Hidden in each level are three star coins that can be collected, which add an extra, optional objective to each level. In addition to the single player mode, there are two multi-player modes that can be played using Multi-Card play or Download play: Mario vs. Luigi, a two player mode where players compete to get the most stars, and Minigames, where up to four players compete in various touch screen mini games. Wii U (Virtual Console) 2015 A direct port of the game released as a digital download on the Wii U Nintendo eShop, with added Virtual Console emulator features. This page was last edited on 1 November 2018, at 10:46.